Priscilla Tea, 1983, Milan, Italy has always worked from the same formal constraint, that of the landscape painting. Inspired in the early noughties by the work of her peer, the artist and architect Andreas Angelidakis’s work, especially that in the online virtual world ‘Second Life’, Tea set out to explore what a contemporary vista was. Since then her paintings have drawn on the ideology of the expansive, endless online space. 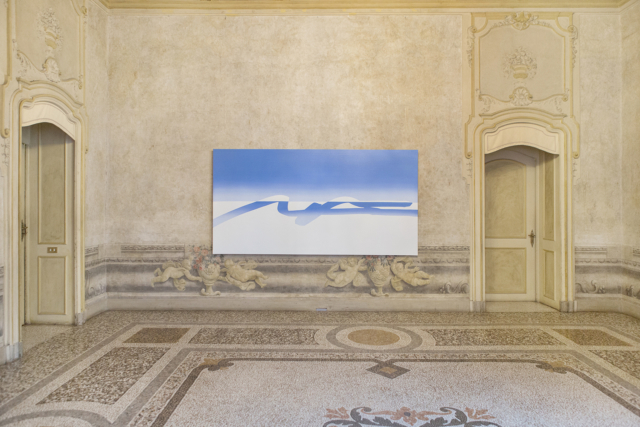 Huge paintings, up to 10 meters long, explore subtle digital gestures, combining fragments of architecture and horizon lines. Painted with the best oil colours in fine brush strokes these works concretise the uninhabitable landscape of the online. Tea’s solo exhibitions include; Neumeister Bar-Am, Berlin (forthcoming 2017); Hussenot, Paris (2016); The Composing Rooms, Berlin (2014); Preteen Gallery, Mexico City (2013) and Gloria Maria Gallery, Milan (2012). Group exhibitions include; Super Superstudio, radical art and architecture at PAC, Milan (2015); Ñewpressionism – Swiss Institute of Rome, Milan (2014); Thessaloniki Biennale 4 – Thessaloniki, Greece; Brutally morbid axe of satan, ReMap4 – Preteen Gallery, Athens, Greece; Guide to the Galaxy – Gloria Maria Gallery, Milan; The Eternal Internet Brotherhood – Mexico City (all 2013); BYOB – Museo Pecci, Milan (2012) and BYOB – Padiglione Internet (The Island of the Net), Venice Biennale, Venice (2011).